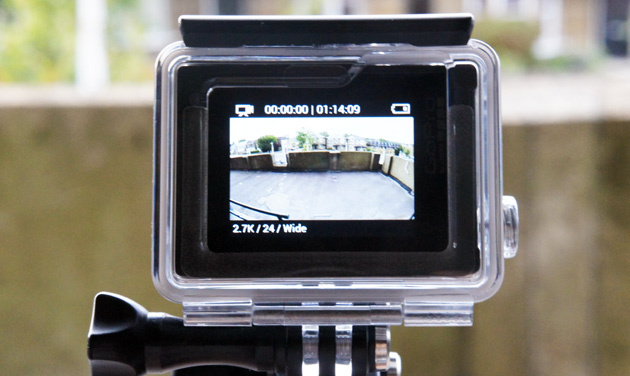 GoPro started life as a home-brew wrist-mounted 35mm camera, but it's come a long way since. Today we're getting a look at the next installment of that story: The Hero4. The latest cameras from the action sports behemoth bring some anticipated features, along with a few surprises. Most notably, while the Hero4 still comes in three tiers/editions, there are greater differences between them. Black is still the top-specification model (more details of which after the fold), but Silver has a few neat tricks of its own. Finally, the White edition is out; in place is a new camera simply called "Hero." The new family structure is essentially: professionals, prosumer/consumers and entry level -- which isn't that different from before, just this time around it's more pronounced. "Enough already. Tell me about the features," I hear you say. Glad you asked, follow on below for details. The daddy of the family, Hero4 Black, has two key features that fans of GoPro have been waiting for since the Hero3: 4K video recording at 30 fps, and 1080p now at 120 fps (you can also grab 2.7K at 50 fps!). The Hero3 did 4K, but only at 15fps, making the feature less useful for professional projects. The Hero3+ didn't improve on that (and perhaps suggests why that wasn't branded the Hero4). But, it looks like GoPro figured out how to deliver a full 30 fps 4K without ravaging the battery (more on that battery later). Other new features include a "highlight tag," which allows you to mark a key moment in your video via the WiFi button on the side. If you're shooting hours of video at a time, this will make finding those sweet airs/best waves much easier once you import the video into GoPro's Studio software. GoPro's Protune feature (that allows deeper control over settings) also got a face-lift. Now you can control the ISO limit, color and exposure settings. That's especially good news if you're into low-light shooting. Which brings us conveniently onto two other new modes called Night Lapse, and Night Photo. As the names suggest, these are aimed at getting better low-light stills/time lapses. Essentially, you can force a longer exposure for some trippy light effects. The Black edition also features a new audio system, which promises twice the dynamic range of previous cameras -- something we're looking forward to testing in the near future. Two hardware changes that are worth noting are the addition of Bluetooth, as well as WiFi for additional connectivity options (to the remote, or app), and a much-improved battery housing. The cells are different to those found in the Hero 3/3+, which is a bummer if you've built up a collection of spares, but the fiddly back door has gone; the batteries now slide in via a (much easier to open) spring-loaded trapdoor. Battery life is claimed to be the same -- which won't please those that already think it's too short, but it does at least mean you shouldn't be taking a major hit just because of all that 4K you're (now) shooting. If you're thinking, well the Hero4 Black is the one I want then, because the Silver will just be the same, but with fewer shooting options, you'd be partly right. But also very wrong. Silver does top out at 4K/15 fps like the Hero3/3+. But, it has most of the other new tricks (highlights, the Protune tools, night photo modes and so on), along with one big dealio feature that Black doesn't have: a built-in touchscreen display. Finally, there's a GoPro that lets you see what you're recording in real time, and playback photos and videos after the fact. You can also use the touchscreen to set up the camera, instead of using the physical buttons (and tiny monochrome LCD). This is a big deal. Especially as the Silver remains the same size (i.e., it's no fatter, like when you add on the BacPac). Considering most of the pro features make their way over to the Silver edition also, it's really going to make choosing which you want all the more difficult. We got to play with both the Black and the Silver, and are really struggling to choose between them ourselves. Pros will probably still want the Black edition, but there's a great many folk that might consider the Silver the top choice, simply for that screen. It really is a delight. For those looking for fewer bells and whistles (and, in turn, a lower price point), the new "Hero" replaces the White edition. It's very similar on paper. It still shoots up to 1080p at 30 fps, and takes 5-megapixel stills (the Silver and Black go at 12 megapixels). This time around though, the camera and waterproof case are integrated -- meaning the battery is built-in too. This makes it a much simpler proposition for those just looking to charge something up, stick it on a mount and go. The best feature with the Hero, though, is how much it costs. At just $130/£100, it really is going to challenge all those no-brand cameras that only really compete on price. As for the Black and Silver? They will run you $500/£370 and $400/£290, respectively, when they launch on October 5th.